The name might conjure up images of Twilight — both from the vampire aspect and the youthful appearance of the characters. As the name implies, blood is most likely involved. In fact, a vampire facelift uses your own blood to make you look years younger. So how does it work? And is it just a passing fad? MDPen, a professional microneedling company, unravels the vampire facelift. 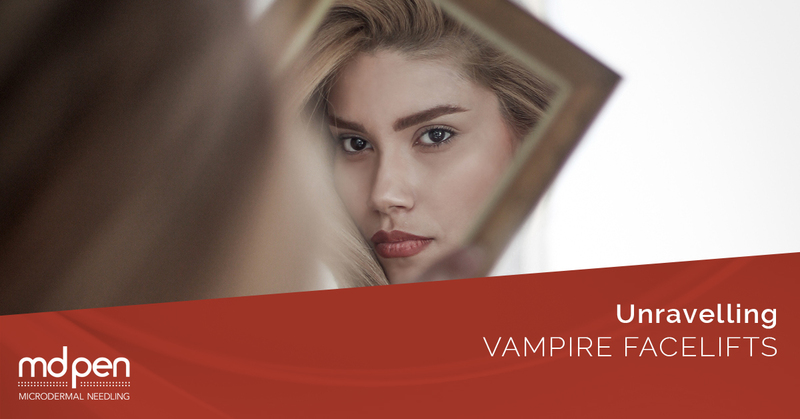 A vampire facelift is a non invasive cosmetic procedure that combines PRP (platelet-rich plasma) therapy with injectables, usually hyaluronic acid dermal fillers. PRP is where the platelets in the patient’s own blood are separated out and injected. Platelets are particles in your blood whose sole job is to aid in clotting when you get a cut. They are only activated when your body senses an injury. Then they converge on the area to stop the injury from bleeding. Due to their function in the body, platelets also aid in healing and reducing inflammation. Platelets have been used for a long time by athletes to help recover from injury but have only recently been used in the fight against signs of aging. Most of the time PRP is used with injectable fillers, which provide the skin with volume. PRP stimulates the cells to produce collagen, the protein in your skin that gives it strength and elasticity. As we age, collagen production decreases, which is what causes wrinkles to appear. When collagen production is boosted, your fine lines and wrinkles diminish, your skin tightens, which helps to eliminate sagging, and your skin repairs any other damage it senses, such as scarring. There are different types of vampire facelifts. The patented Vampire Facelift® was designed and trademarked by Dr. Charles Runels of Alabama. Practitioners who use the patented Vampire Facelift® are specially trained by Runels’ team, use his techniques, and use his special formula for hyaluronic fillers. On his website, Runels states his goal is to standardize the procedure and control quality. WHAT DOES THE VAMPIRE FACELIFT TREAT? Unlike many other non invasive cosmetic procedures, the vampire facelift is purely for cosmetic reasons. It’s for those who suffer from a color deficiency of the skin, sagging skin, and rough and textured skin. Furthermore, the vampire facelift is primarily used on the face only, to rejuvenate the skin and promote collagen production. ARE THE EFFECTS OF A VAMPIRE FACELIFT WORTH IT? Like most non surgical procedures, results vary from person to person. Since the vampire facelift is relatively new, there are no studies pointing to its definitive effects on the skin of patients. To find out its effectiveness on you, there’s really only one way to find out: try it yourself and see. That being said, patients report an immediate change in skin texture and tone. Practitioners say it can take up to three months to see the full effects since you are stimulating living cells, which will take time to produce collagen. Do expect to pay a premium for the PRP component of the dermal filler. Hence, some practitioners say the extra cost, due to the fact of its unproved effects, may not be worth it above and beyond just a dermal filler in and of itself. Like all non invasive cosmetic procedures, the results do wear off with time. Since the vampire facelift is essentially a dermal filler, the filler will eventually dissipate in the body. However, some say the effects last longer, and you may not need another session for up to 18 months. Every person is different and the effects will depend on many factors, such as age, condition of your skin, and ultimately if the results are what you are seeking or not. WHAT IS THE RECOVERY PROCESS FOR A VAMPIRE FACELIFT? As a non invasive surgical procedure, the recovery for a vampire facelift is minimal. Practitioners caution against wearing makeup for about 12 hours afterwards and to avoid strenuous exercise the next day. At the site of the injections, you might have a little bit of bruising and swelling, which will dissipate in the next few days following the procedure. IS A VAMPIRE FACELIFT FOR ME? The beauty of living in the modern age is the number of non surgical skin care treatments available and the freedom to discover what works for you. Alternatives to the vampire facelift include a vampire facial (which uses microneedling instead of dermal fillers), microneedling procedures by themselves, fillers by themselves, such as Botox, and chemical peels — among a long list of skin care products as well. Vampire facelifts won’t be for everyone. One caution: if you are on blood thinners, a vampire facelift is not recommended. If you have any kind of medical concerns before undertaking a non invasive cosmetic procedure, consult with your physician first. It seems like every time you turn around there is a new non invasive cosmetic procedure to hit the market. Keeping up with skin care trends can be challenging. MDPen, a professional microneedling company who also offers micro needling training courses, strives to keep you updated on all the latest in skin care, cosmetic procedures, and non invasive cosmetic procedures via our News page as well as via Facebook. Here, you’ll find trends, statistics, and informative articles not only on microneedling, but also on any and all topics related to your skin and beauty. Our goal is to educate you on your options, so you can make the best decision for your particular skin type and your individual goals. We believe wholeheartedly in the value of professional microneedling to help reverse the signs of aging, improve the appearance of acne scars and stretch marks, aid in hair rejuvenation, and diminish skin discolorations. Microneedling is stimulating collagen production in your skin through the use of a microneedling pen. When microneedling is used in conjunction with other non invasive cosmetic procedures, results can be amazing since you are effectively doing a two-for-one wallop to your skin. Added to your daily skin care regimen, microneedling and other non invasive cosmetic procedures can erase years from your appearance and boost your self-esteem and self-confidence, especially if you are suffering from scarring or discolorations of the skin. MDPen exists to improve your life, not just your appearance. When you feel good about yourself, amazing things happen in your life. You are more energetic, more willing to step outside your comfort zone, and more willing to enjoy the fine things in life such as trips to the ocean or the mountains — one of the reasons for all your hard work at your job. Life begins to unfold in surprising ways, and you embrace it, instead of running from it. If you think microneedling may be for you, MDPen invites you to visit our website. With a wealth of information on everything microneedling, from professional microneedling machines to microneedling equipment to in-depth articles on what is microneedling, you’ll be sure to find answers to your questions. We also list our microneedling practitioners on our site, so you can find the nearest professional microneedling practitioner near you. If you are looking for the best serums for microneedling, MDPen produces its own proprietary line of skin care products that fight the signs of aging and promote a more youthful appearance. Visit our site today!